Chime is an elegantly-designed game and a lovely way to unwind, particularly with Philip Glass’ gorgeous “Brazil” in the track list. (“Brazil” has Glass’ usual musical furniture, but the cut, taken from the Aguas da Amazonia album, is executed by the extraordinary Uakti ensemble and takes on a new set of timbres.) One relevance to Create Digital Music – it’s not a bad way to take a break after a production and/or programming stint. The game is 500 Microsoft Points for Xbox Live, the lion’s share of which goes to children’s charities. How is this a “music game” and not just a variant of Tetris? Well, again borrowing (liberally) from Lumines, Chime has a playback “wiper” that scrolls across the screen from left to right. 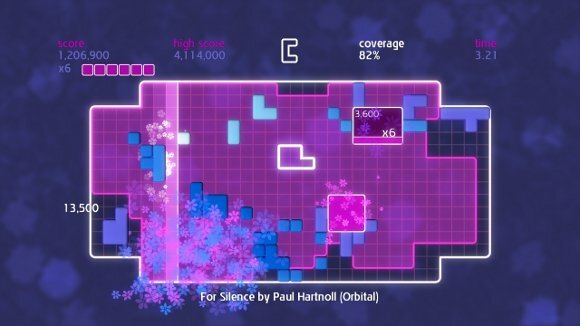 In fact, it’s not so much that Chimes or Lumines are music games as it is that digital musical interfaces in general tend to use left-to-right, linear, step-sequencing grids. The tracks are all pre-composed, whether Glass or Moby, so the blocks themselves just add little musical “flairs,” kept in time to the music. And that brings us to the limitation: it’s funny to me that these games tend to do so little musically. Lumines, at least, provides satisfying rhythmic cues that align with gameplay. Chime is so subtle, you’re barely aware that the blocks impact the music at all. Aesthetically, that works well: the addition of music feels seamless, focusing the user on gameplay – and this is a game. But perhaps it’s not really game design that’s at fault. Music lacks a strong generative tradition, and musical interfaces are only now taking baby steps into anything that looks different from conventional interfaces. Indeed, it seems what’s urgently needed is for people who work on interaction design and people who work on music to start to work across disciplines. In fact, I’m seeing far more innovation with game interfaces than musical interfaces. Of course, that’ll require a lot of programming time. And that means you’ll need a break. And for a break, I still recommend Chime. Sure, the musical selections are a bit oddly matched, with Lemon Jelly’s Fred Deakin, Moby, Orbital’s Paul Hartnoll, Markus Schulz, and … Philip Glass. But it’s still quite fun. And you can say you’re doing it for the kids.